Fleet managers know that tire depreciation can negatively impact profitability. Replacement tires alone are the second-largest operating expense for fleets. The TIA-certified tire technicians at STTC understand how to get the most out of your tire life. 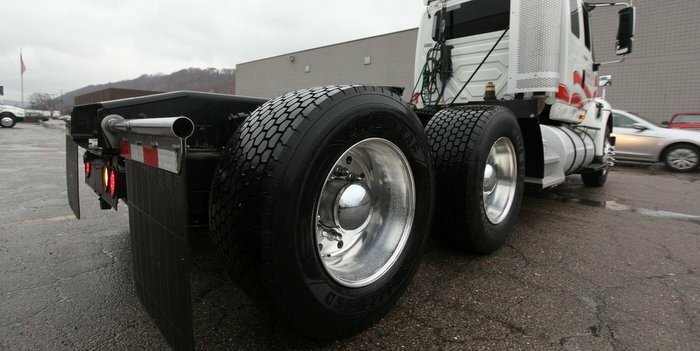 We’ve developed ten helpful tips for extending the life of your commercial trucking tires. Inflation pressure is directly related to the rate of tire depreciation. Make sure your drivers perform pre-trip inspections with weekly or daily air-pressure checks, depending on the length of their route and daily driving behavior. To get the best tire performance, you need to ensure proper inflation pressure for the load with which you’re traveling. You can determine the right air pressure for your commercial trucking tires by gathering information on your fleet’s axle loads and comparing those to online charts available on most tire companies’ websites. Traveling at higher speeds increases the heat on your tires, causing them to wear out faster than necessary. In fact, Goodyear data shows that when drivers increase their speed from 55 mph to 75 mph, they reduce total tread mileage by 20% or more. Aggressive driving and braking can produce excess wear and tear, not only on tires but on more serious mechanical components. Don’t let high demand on your deliveries ultimately increase your spend on maintenance and replacement parts. Your drivers should also check their tire tread regularly to catch premature and irregular wear before it escalates. Have them perform routine checks visually or by feeling for irregularities with their hands. Be sure that when you do replace a tire that it matches or is as similar as possible in tread wear to the existing tire across from it in the same position. If not the tire with a deeper tread depth will wear prematurely due to excessive scrubbing. Rotating your tires allows them to wear evenly by bringing tires from the back up front and vice versa. A tire can be retreaded up to three, sometimes even four times and still work great. This is a cost-effective way to both extend tire life and maximize your fleet budget while operating safely. The inside tires on dual assemblies are prone to being neglected because they’re more difficult to check for proper inflation. Give your inside duals some love by checking on them regularly. A recent study revealed that many fleet managers aren’t understanding the reality of their expenses. Make sure you know all the metrics related to tire depreciation as these can have important implications for other aspects of operations, such as fuel economy. STTC helps fleet managers understand expenses and fleet metrics better by using our proprietary OTRTracker Program. See all of your fleet’s inspection data in one place so you can make smarter decisions for your commercial trucking business. Contact our team today for more information on how STTC can help your fleet’s profitability.